Statistics have shown that the average person, I said average, will increase their weight by 5 to 15 pounds between October 31 and January 1. Halloween candy, parties, more alcohol, bigger meals and more of them over three months can certainly add up. Most people can and will put weight on relatively quickly. Taking it off, however, can be twice as difficult. It certainly doesn’t have to be this way, and you don’t have to be that person who finds themselves not fitting into their clothing on January 2. It’s not all about self-control. In fact, it’s more about being mindful and wanting to stay as healthy as possible through one of the most stressful times of year. Start by eating healthy. This in no way implies that you cannot enjoy the Holidays. The Holidays should have special meaning. Spending time with family and or loved ones, sitting down to a beautiful meal and being engaged in it all. 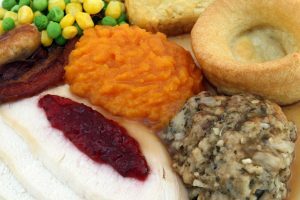 Here are some great ways you can go into Thanksgiving, and or any other Holiday meal and stay on track. Never go in starving. This is an immediate invitation to overeat. Eat a normal breakfast and snack or lunch, just as you would on any other day. Don’t drink too much. If you are a person who enjoys a drink, then do just that. Sip a beverage for as long as you possibly can. Alcohol will not only make you crave sugar, it hinders our ability to make good choices, as well as dehydrate you. Be sure to increase your water consumption. Whether it’s a buffet or restaurant, or family style; create your plate. Pick the things you absolutely want, tastings of each, keeping portions in moderation. Not only will you feel better if you don’t stuff yourself, but you will not pass out on the couch while watching football. Always remember this isn’t your last meal. Three to four hours later, you can make another plate and eat again. Wow what a revelation. If you are the cook, try not to pick too much during the preparation. You may need to touch food to your tongue to test the flavor but use your nose too. If food smells delicious, chances are, it will taste that way too. Try not to focus on the food. If you are with family and/or friends, be with them, engaged more in their company, and less on what you can eat next. Get enough rest. If you are going into a Holiday or a party tired, you might go right for the sugary carbs. Remember, overeating, sugar, alcohol and lack of rest can suppress the immune system, causing us to become ill more easily. We all tend to run ourselves ragged during the Holidays. Eating right, getting plenty of rest, drinking enough water, and sticking to our exercise routine are all helpful in keeping our immune system strong. Always remember our focus at In8 Wellness Centers is to keep you healthy. Don’t struggle through another Holiday season. If you need some help with your nutrition, book a consultation today.